In 1773, King George III of England appointed naval officer Constantine John Phipps to command an Arctic expedition to search for a passage to the Pacific Ocean. Instead, on the ice fields near Spitsbergen (now Svalbard), Norway, Phipps found polar bears. The explorer was the first to describe the bears as a distinct species, Ursus maritimus. Were he to undertake the journey today, Phipps would spot polar bears not on sea ice but wandering along rocky shorelines, searching for frozen water. For polar bears—marine mammals and apex predators of arctic realms in Norway, Canada, Greenland, Russia and Alaska—everything begins and ends with ice, or more to the point, with the ice edge. For the bears, that edge is the thin line between life and death. If sea ice continues to melt at its current rate, scientists believe two-thirds of the world’s 20,000 to 25,000 polar bears could be gone by 2050. Sea ice is vital to polar bears because the surface provides the platform on which bears can travel and from which they are able to hunt for their choice prey, ringed seals. Found in arctic waters on ice floes and pack ice, ringed seals—also known as ice seals—scratch away at the ice with clawed flippers, maintaining open breathing holes and allowing them to live where other seals can’t. Polar bears prefer a ringed seal dinner over that of any other seal species. On average, it takes 43 ringed seals per year to feed one polar bear, according to biologist Ian Stirling of the Canadian Wildlife Service and the University of Alberta. A population of 20,000 polar bears worldwide would need more than 1 million ringed seals (or ringed seal equivalents, as measured by the sizes of other seal species) to survive. But global warming is now affecting the formation of the sea ice and harming the polar bear’s ability to capture its essential food source. This spring and summer brought more bad news for the bears: The average level of carbon dioxide in the Earth’s atmosphere reached a record high of more than 400 parts per million. Carbon dioxide, a product of fossil fuel use, is a “greenhouse gas” responsible for trapping heat in Earth’s atmosphere—the more fossil fuels, the more global warming and associated effects on the environment. The extent of this summer’s arctic sea-ice cover, for example, was the sixth lowest since 1978. In Canada’s Hudson Bay, where sea ice melts each year in early summer, polar bears go ashore for several months and exist on stored fat reserves until late fall when the ice refreezes. 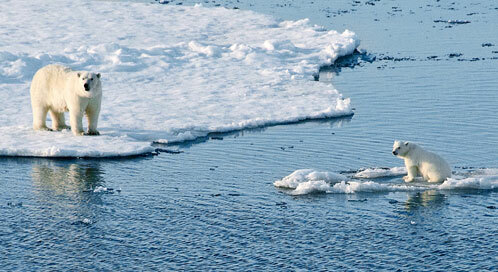 But with ice break-up arriving sooner, and ice freeze-up happening later, the bears have fewer weeks to hunt seals. “Already, consequences have been documented in the western Hudson Bay population,” says Martyn Obbard, a biologist at the Ontario Ministry of Natural Resources. “The bears are declining in health and number.” Now the southernmost polar bears in the world in an extension of Hudson Bay—known as James Bay—are also at risk. The story of one polar bear there may foretell the species’ future, if we don’t rapidly develop more alternate- energy sources. In September 2012, Obbard and colleagues placed GPS collars on several polar bears on Akimiski Island in James Bay to monitor them. Signals from one bear, an adult female the team collared on September 18, 2012, suddenly ceased on December 5, 2012. The biologists assumed the bear had managed to give her collar the slip. “When bears drop collars, it’s a major disappointment,” says Obbard. GPS collars are expensive, so he asked biologists with the Ontario Ministry of Natural Resources goose research project on the island to recover the device during their nest searches the following May. Based on data from her collar, she remained near her capture location until late October. Then she ventured forth, walking the entire coast of Akimiski Island and back by late November. In early December, she made her way to a small islet off Akimiski and returned—then stopped. “Between September 18 and December 5, she went an astounding 404 miles,” Obbard says. Her demise, the researchers say, is a harbinger of the consequences of changes in sea ice duration, especially delays in freeze-up. For polar bears to stay alive, say biologists Robert Rockwell of the American Museum of Natural History in New York and Linda Gormezano of the University of Montana, their food preferences need to change with the melting of the ice. Bears along the west coast of Svalbard are going after the eggs of birds called pink-footed geese. On Svalbard’s coastal tundra, goose nests are common on rocky outcrops near the shoreline. Close enough for the long reach of a polar bear paw. “In 2011 and 2012, polar bears started invading the pink-footed goose nesting area to feast on goose eggs, a behavior they hadn’t shown in previous years,” says biologist Jouke Prop of the University of Groningen in the Netherlands. The bears selected locations with the largest number of nests. The change in bear behavior also affected barnacle geese along the Svalbard coast. To safely hatch their eggs, these geese nest on coastal islands that egg-eating arctic foxes can’t reach. 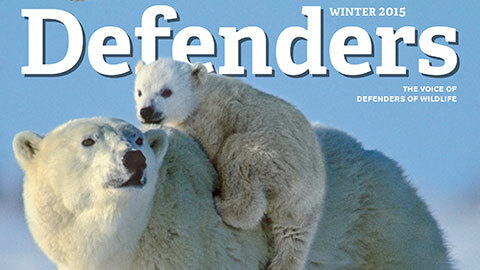 “But the islands are easy targets for polar bears in search of food,” says Prop. According to Prop, the bears’ interest in goose eggs likely stems from the deteriorating condition of their main hunting habitat, sea ice, which makes their ringed seal prey inaccessible. “When we find species in the planet’s most remote places declining from our actions, we know how pervasive those actions are,” says biologist Stuart Pimm of Duke University. With climate change affecting the bears’ future, conservationists wonder if it could already be too late for polar bears. But they are not ready to give up hope. To this end, Defenders works with villages in Alaska to find ways to keep bears away from human settlements and to use bear-resistant food storage containers. Defenders is also partnering with state and federal agencies to increase local community involvement and oil-response preparedness should an oil spill happen in Alaska. Ecologist and science journalist Cheryl Lyn Dybas brings a passion for wildlife and conservation to Defenders, National Geographic, BBC Wildlife, Scientific American, The Washington Post and other publications. Scientists predict that American polar bears could face extinction in the next 50 years if urgent actions aren't taken to help them survive. You can help. Adopt a polar bear.